Zolv are pleased to announce the rebrand of their award winning product SalesAssist to Full Picture. Zolv who create custom software, tools and websites for the travel industry created SalesAssist 18 months ago. As we have developed the product over time, it was felt the brand SalesAssist reflected more the process rather than the end result of the product which was customer facing, so a new identity was needed. Full Picture takes end users on a visual conversation with an agent. Imagine your conversations coming alive by sharing photos, video, deck plans, brochures and more directly to your customer's screen as you take them on a virtual tour on board. Everything the Agent needs is just a click away; all the customer requires at their end is an open browser. With Full Picture the agent is able to excite and inspire, the customer enjoys a more authentic and richer experience, informing and reassuring. The agent has a natural and intuitive way to increase upsell opportunities and conversion rates. 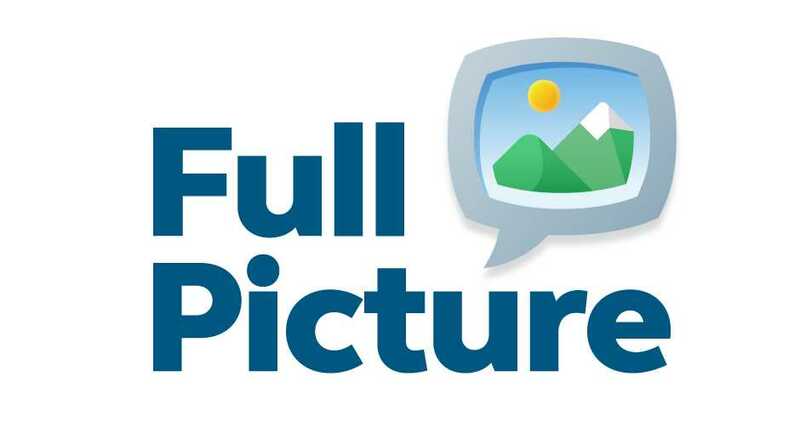 The Full Picture logo was created with the illustration of a speech bubble that contains a picturesque image to visualise the company’s concept ‘The Visual Conversation’. The rebrand will include a new website and social media handles, all using the new identity.